We are working on the English version of our website. 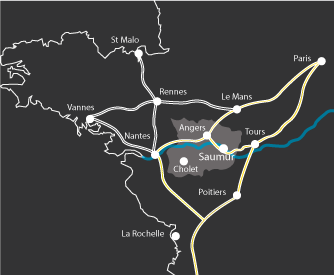 In the meantime, we invite you below to make an initial discovery of Saumur and its region in your language. And for more detail, we also invite you to visit our website using the proposed provisional translation by Google Translate. With its heart in Anjou, its eyes in Touraine and its arms full of treasures : châteaux, abbeys, mills, stunning views of the Loire and the vineyards, towns and villages to explore on foot, by bicycle or horse-drawn carriage - this is what the Loire Valley is all about. There are so many things to see here including the mysterious underground dwellings along the Loire river cliff and on the plains of Doué-la-Fontaine, ‘capital of the rose’. Menhirs and dolmens which are all evidence of important prehistoric activity. The Authion Valley, dedicated to gardening and horticulture, the forest areas of Beaufort-en-Anjou and Loire-Longué with their strange, twisted churchspires, dotting the landscape. The charming diversity of small rural heritage and even boule de fort, a regional speciality and the only sport in the world where you have to wear slippers ! Dream with your eyes wide open! Saumur has a soft tuffeau heart, a myriad of châteaux, manors, sixty listed churches, the largest monastery in Europe, but also dozens of megaliths. Nature, landscapes and a gentle climate have inspired humans here for many millenniums! Eating out in the Saumur area, a paradise for gourmets. Vines as far as the eye can see, troglodytic cellars and vineyards all grace the Saumur hillsides along the delectable ‘wine route’. A path, trailing through the fields and under the earth, leading to the discovery of the famous Loire Valley vintages. You can’t get too much of these highly prestigious cellars! It’s not just wine that matures in the cellars. Mushrooms are cultivated also into. In the warm intimacy of the cellars, you can have a Rabelaisian feast: succulent fouées (hot-breads), or galipettes (large mushrooms), stuffed and cooked in the oven. An untamed river that likes to give it a whirl! It’s like a giant mirror that reflects beauty for nearly 30 km. The Loire glides past religious jewels, ports, tuffeau cliff sides and a multitude of protected bird islands. The term masterpiece is none too strong for this UNESCO World Heritage Site. and B&B which offer the public originality and charm. In Saumur, the capital of equitation, the signs are everywhere. The Cadre Noir, heir to the French equestrian tradition, has been part of the Riding School since the 17th century. The Equestrian Museum, Cavalry Museum, Armoured Vehicle Museum, carriage rides, saddlers and boot makers, all refect the strong influence of this activity. Saddle-up! Visit our online 2019 guide "Destination Saumur Val de Loire"
To receive our "Destination Saumur Val de Loire" guide simply fill in this form and we will process your request within 24 hours. Delivery times of mail do not fall within our jurisdiction but we hope you will very quickly receive the brochures desired.